This beautifully easy, seamless raglan is a cozy layering piece. Slightly oversized fit, knit in garter stitch with split side seam and colorblocking detail. Knit in soft cotton blend, but would be perfect in a soft wool for winter. Diagram 2 in updated pattern has correct numbers. This is a simple knit with easy construction. 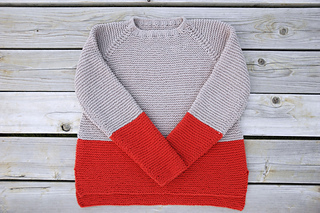 Circular knitting, knit, purl, decreasing, increasing, casting on, attaching sleeves to a circular knit sweater, and picking up collar stitch skills are helpful to know. Grafting in garter stitch for the underarm stitches is not required, but provides the best finish.